Perhaps you recall that our little yellow duck courageously fought his way to a 12th place finish in the 2011 Breckenridge Duck Race. Well, he did. 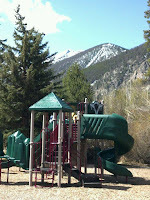 (see Pictures from the 2011 Breckenridge Duck Races). When you are talking thousands of ducks, 12th place is pretty impressive. It is in fact impressive enough that it earned the Colorado Shepards a prize. That little yellow ducky won a gift-certificate to Beaver Run, which is a resort in Breckenridge. The amount on the gift-certificate was enough to cover one night in a two-bedroom suite during a non-peak time of year (it would have covered about half a night during ski season). My wonderful wife figured out that based on everything else we have going, this weekend was when we would have to use this. 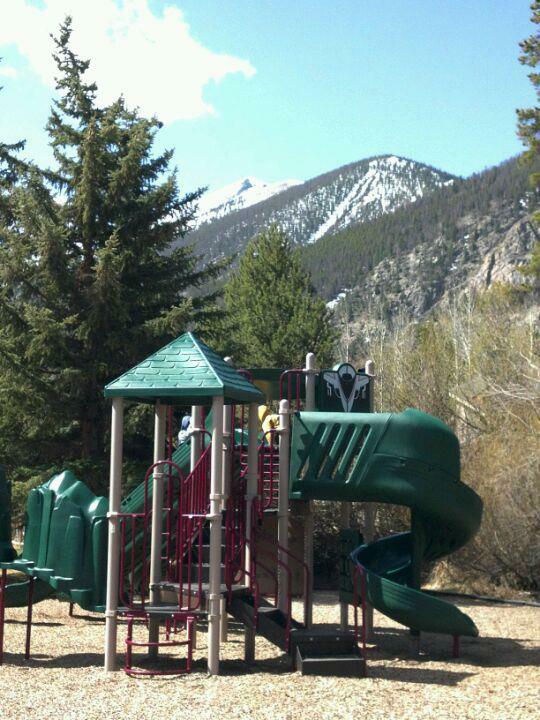 So, we headed up to Breckenridge this weekend. Sunday, I brewed my Tommy Hawk APA. Tommy Hawk is actually more in the American IPA range, but it started out as an APA, and I just decided to keep the name as a bit of a reminder as to where this beer came from. Tommy Hawk is one of the beers that started out as a Mr. Beer recipe, got upgraded to a partial mash, and then upgraded again to all-grain. 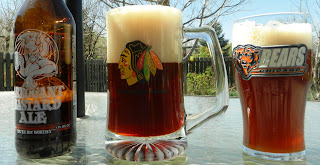 This is my 5th time brewing Tommy Hawk, although it is obviously much different now than batch 1 was. 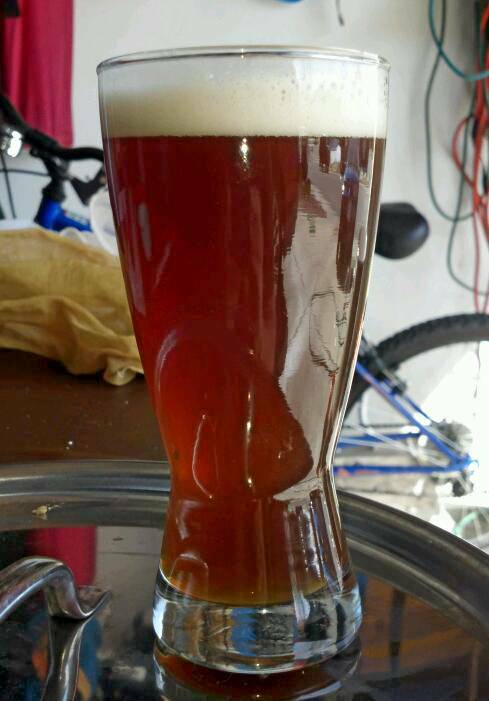 It is essentially the same recipe as batch 4, except that I am using the hops a little differently. This time, rather than a traditional bittering addition at 60 minutes, I decided to try first wort hopping (FWH). Basically that just means that as I drain the wort from my mash tun, the hops are added and steep through the steeping process. Theoretically, this give a more smooth, less harsh bitterness with more flavor than a traditional bittering addition. The BlackHawks lost last night. This does not make me happy. All four games so far went to overtime. It is possible that they come back to win the series, but not likely. I sure hope they do, because at this point I cannot think of another hockey team I can endorse this year. Any team that is as offensively gifted as the BlackHawks are but have such a pathetic power-play does not deserve to win a championship. Besides as a Hawks fan, I cannot be too greedy. I have already seen my once-every-50-years Stanley Cup. Last night I needed a "New Brew Thursday" beer. As I didn't have any and really did not want to go out and buy one, I decided to try blending the two beers that are currently in my keggerator. Blending, of course, is a technique a fair number of commercial breweries use. For the most part it is done with barrel aged and/or sour beers as a way to add consistency to the final product year after year. They can also use it to come up with new beer flavors that would be difficult to achieve with one beer. New Belgium, for instance has the sour base of La Folie (they call this base something, but I cannot think of the name they give it). They blend it with different styles to get most of the sours in their "Lips of Faith" series of beers. So, here at the SheppyBrew home-brewery we are at the end of another quarter. 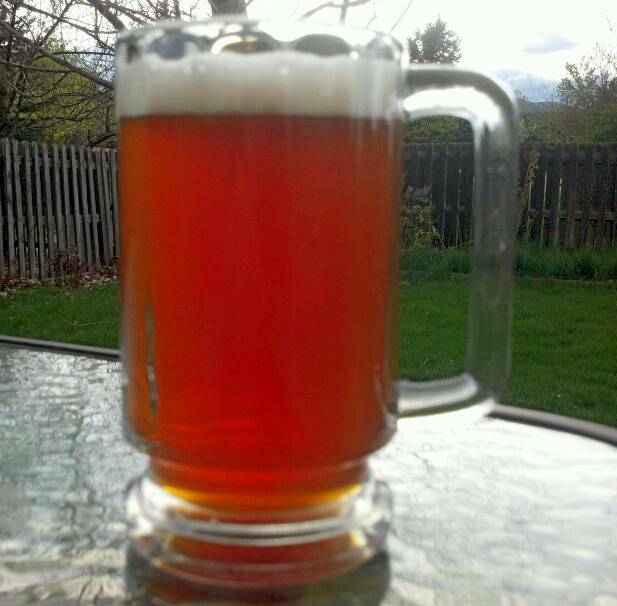 This means that it is time again for me to share some more of my brewing stats (see SheppyBrew 2009 Stats, 1st Quarter Stats, 2nd Quarter Stats, 3rd Quarter Stats, SheppyBrew 2010 Stats, 1st Quarter Brewing Stats, 2nd Quarter Brew Stats, SheppyBrew Stats Q3 2011, 2011 SheppyBrew Stats). Believe it or not, I have had people say they like to read these brewing stats posts. 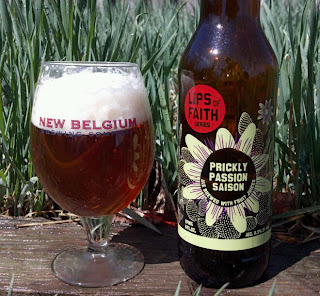 At some point in the not-too-distant past I procured a 22 oz bottle of New Belgium's Prickly Passion Saison. It has been sitting in one of my beer fridges for quite awhile and I sort of forgot about it. A few days ago, while looking through my beer inventory I discovered the bomber and thought, "wow, I should drink that with Easter dinner." And so, when it was almost time for Easter dinner, I popped it open and poured it into my New Belgium globe glass. 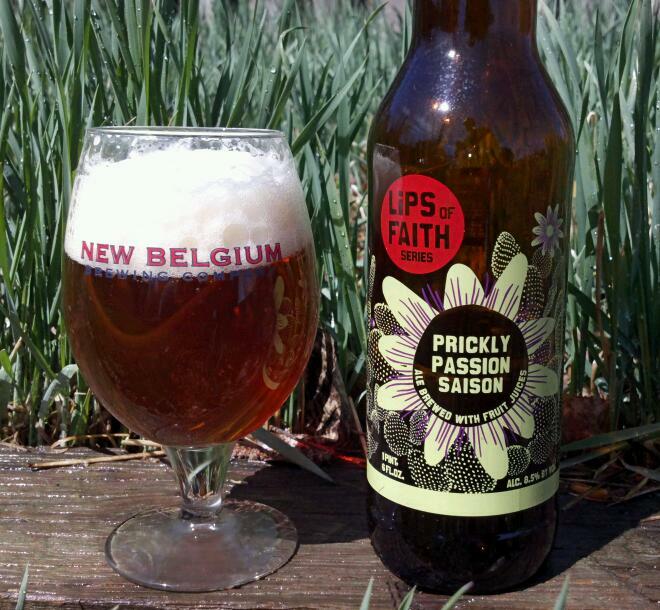 It is, of course one of the New Belgium "Lips of Faith" series of beers. It does not disappoint. It pours golden amber in color with a beautiful, thick just-barely-off-white head. It is nicely carbonated, almost sparkling in its effervescence. Going through my Google Reader this morning reminded me that tomorrow is Session Beer Day. Coincidentally, it is also National Beer Day. If you check-in a beer under 4.5% ABV on untappd tomorrow, you will earn yourself not only a beautiful Session Beer Day 2012 badge, but also a National Beer Day badge. Two for the price of one.